Orion 52205 GrandView 16-48x65mm Waterproof Spotting Scope | Spot On! With excellent fully multi-coated optics packed into a durable, waterproof housing, the new Orion Grandview Waterproof Zoom spotter will amaze you with crisply detailed views of the outdoors. 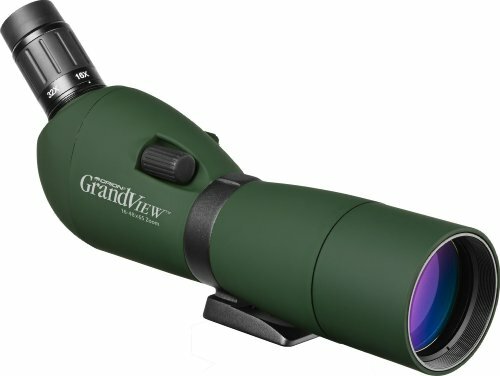 Like the name says, the Grandview spotting scope provides a zoom magnification range of 16x all the way up to 45x and features a big, 65mm objective lens for bright daytime views full of contrast. Fully multi-coated optics throughout the spotter ensures maximum light transmission for sharp, finely resolved outdoor observations. Scan the surroundings at low 16x power, then bump up to 32x or 48x for closer looks of interesting birds, wildlife, scenic landmarks, or other outdoor targets. An extendable dew-shield helps to prevent dew from accumulating on the objective lens, and also optimizes your views by blocking peripheral light. Focus adjustments are buttery smooth so you’ll enjoy every outdoor spotting session with this portable spotter. The Grandview 16-48x65mm spotting scope’s zoom eyepiece is positioned at a convenient 45 degree angle so you can view objects on and around the horizon in contortion-free comfort. A nice metal thread-on eyepiece cover keeps the spotting scope’s eyepiece safe and clean when not in use. The waterproof Orion Grandview 16-48x65mm Zoom Spotting Scope can be attached to a wide variety of tripods and altazimuth mounts, thanks to its narrow-format dovetail mounting block which features multiple 1/4 inch-20 threaded sockets. You can even rotate the Grandview Zoom Spotting Scope within its tripod mounting collar, and use the attached thumbscrew to secure it in-place to lock your preferred position. Built for the outdoors, the affordably priced Grandview 16-48x65mm Waterproof Zoom Spotting Scope can be taken virtually anywhere you roam in its soft, view-through carrying case with adjustable shoulder strap.